A group of high-level representatives from Australia’s Coalition Government gathered last Thursday to help an 80-year-old family-owned foundry business make the giant leap from the oldest form of manufacturing to the newest – additive manufacturing. 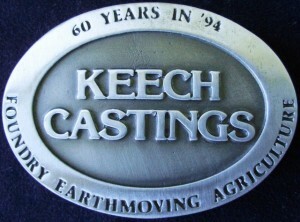 According to the Business Spectator, owners Keech, Garth and David – members of the third generation running the Keech Australia family business – have recently invested $1 million dollars to acquire the necessary equipment that will help them carry out a smooth transition from the dying foundry business to the high-tech, multi-purpose 3D printing business. Having received a grant from the Victorian Department of State Development, Business and Innovation’s “Investment in Manufacturing Innovation Fund”, the company that goes by the name Keech 3D Technology has become the first commercial supplier of large format 3D printing in Central Victoria. The official launch of the Keech 3D Advanced Manufacturing’s new $567,000 3D printer – which is already boosting the company’s business productivity and helping it tap into new overseas markets – was attended by Minister for Manufacturing David Hodgett, Liberal candidate for Bendigo West Jack Lyons and Liberal candidate for Bendigo East Greg Bickley. Speaking at the event, Mr Hodgett said Keech 3D Advanced Manufacturing (formerly Bendigo Patternmakers) had established export relationships with Hitachi in Japan and with companies in France, China and the United Kingdom. “The effective use of this innovative technology demonstrates how Keech 3D Advanced Manufacturing is adapting successfully to changing demands in the manufacturing industry. I am pleased the Victorian Coalition Government was able to contribute an Investing in Manufacturing Technology (IMT) grant of $141,700 to support Keech’s acquisition of this technology,” Mr Hodgett said. According to the media release by the Premier of Victoria, Keech 3D Advanced Manufacturing was originally established to provide pattern-making services to parent company Keech Castings Australia’s Bendigo foundry. While it continues to perform this function, the new company now also provides prototyping, design, tooling and advanced manufacturing solutions to diverse industries around Australia and overseas, and thanks to the new 3D printer it is transitioning several of its staff to higher roles.